THE Northeast is abound with natural beauty and flying in this region is a wonderful experience. The landscape is a delight to watch as vast green stretches of tea gardens merge into the mammoth Brahmaputra and its tributaries followed by the thick rain forests and formidable peaks of the mighty Himalayas. But despite all this, the region can be treacherous, forbidding and inaccessible. For the sentinels of our frontiers and the sky - - jawans of the Army and the IAF pilots who fly in this area — the “land of seven sisters” is also a land of challenges. It consists of peaks as high as 23,000 feet with steep valleys. The upper reaches of these valleys above 14,000 feet are snow bound round the year and thick jungles cover the terrain below 10,000 feet. This region is inhabited by several hill tribes and the sparse population is widely dispersed in the numerous valleys with small to medium-sized villages in each valley. Surface communication networking has remained a challenge in the area and most of the hill region continues to be isolated due to an inadequate road network. Besides the civilian population, a large number of Army personnel maintain outposts that are virtually cut off from the rest of the country. Thus, for all of them air logistics is the only means of providing rations and other essential commodities to the troops and the civil population. EAC’s air logistics operation has been continuing since the Burma campaign. The transport and helicopter fleet of the IAF has kept up the lifeline for troops and civilians alike in the remote and inaccessible terrain for the past 50 years. These magnificent men and their flying machines provide succour to several in the far-flung areas. Air logistics operations are a highly specialised job involving multiple variables which require a higher than average skill level as both the transport a\c and choppers are operated at the critical limit of the flight envelope with reduced safety margins. The East provides varied and unpredictable weather that keeps the aircrew on its toes all through the year. Sudden showers or cloud buildup combined with the hostile terrain have led to the maxim: ‘‘know your area, know the weather and know your area better in bad weather’’. The media team that visited forward area IAF bases had a taste of the fickle weather during the visit as a bright and sunny morning sky at 6.30 am transformed into a dark mass within an hour’s time. Thus the day’s plan had to be revised and replanned several times in accordance with the will of weather gods. Sometimes the clouds packed up, while the pilots strapped up forcing every one to return after an aborted flight schedule. This kind of fickle weather coupled with clear air turbulence, strong up draughts and down draughts, low clouds, convective buildup, poor visibility and hill shadow, calls for a very high level of flying skill as all the faculties of a pilot are stretched to the maximum in this region. "Flying in this sector is much more challenging than in the northern sector" — is the common reaction of most of the transport as well as helicopter pilots. Thus the advice that is the key to successful air logistics in the area is: "you can take chances with the hills and you can take chances with the weather, but it is suicidal to take chances with the hills and the weather at the same time." An-32 and Mi-17 choppers are mainly used for air logistics in the region. 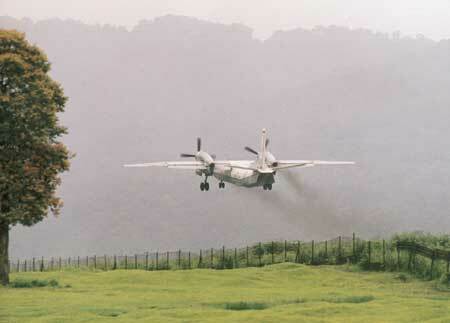 An-32, the workhorse of IAF’s medium-lift transport fleet, has been performing this duty since 1984. This multipurpose, all weather aircraft not only can carry cargo up to 6.7 tonnes but can also evacuate casualties and carry bombs externally and internally. Up to 42 para troopers can also be dropped in the tactical battle area. Different types of loads dropped by AN32 are free drop for foodgrains and other things. The Army and Assam Rifles have deployed their troops in the forward posture and the choppers are the only means to provide rations and other essential commodities to the troops. The rapid progress made by the border roads is largely due to the effort put in to airlift voluminous construction requirements like bulldozers to the remote areas. These choppers also lend a helping hand to the civil agencies during flood relief operations, casualty evacuation and search and rescue operations, apart from the “Air Sea Search and Rescue” role during air-to-air activation over the Bay of Bengal. Mi-17 is also a lethal war machine. 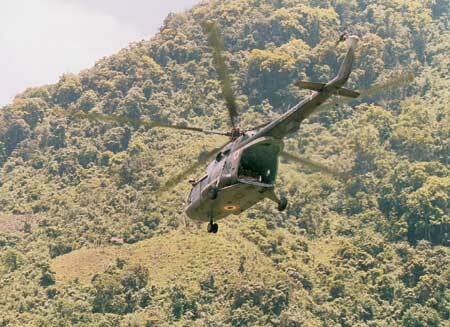 It is one of the most heavily armed choppers in the world. Chetak and Cheetah helicopters have got the sobriquet of Hovering Angels due to their role in evacuating people during natural calamities. Airdropping supplies is a specialised field as the margin of error during the drop is minimal. Flying in the difficult terrain, negotiating weather, aligning the aircraft correctly, ejection crew ensuring quick removal and securing of load with ramp open at an outside temperature as low as -5 C are some of the factors that test the skill levels of all crew members during a drop sortie. Drop zones are generally situated in narrow valleys on sloping grounds. The drop has to be precise and concentrated so that losses are minimum and, therefore, margins for errors are very low. There is no R/T communication to most DZs and it is identified visually. Navigation to the DZ is tricky with change of seasons, height and visibility conditions. The problem becomes more acute in the pre-monsoon season when jhoom cultivation is practised, causing widespread smog in the area. For flying to some of the DZs the aircrew has to use oxygen masks. Advanced Landing Grounds (ALGs) are established to provide basic infrastructure in terms of refuelling, air traffic control communication, meteorology for undertaking FW helicopter operations. These differ from normal airfields in many ways, these are semi-prepared surfaces with restricted length and width. These have runways that are half the width of normal runways and the runway lengths range from 3,600 feet to 4,200 feet. The conventional stopways over the run and undershoot needed for civil/air operations are not available. All ALGs have a unidirectional takeoff and landing. There are limited communication and fire-fighting facilities, and no navigational aids are available en route to or at these ALGs. The surface is mostly uneven. The approaches are steep due to obstructions and circuits are unconventional. Men and materials are carried from these ALGs to far-flung helipads and drop zones. All flights have their ups and downs but the one to an ALG also has its lefts and rights as the aircraft negotiates the valleys and mountains and to top it is the bumpy landing experience, which leaves hordes of butterflies loose in your stomach. However, a close look at the bitumen and pierced steel plate runway after getting down revealed the level of precision required to land there. But for the villagers of the area and the jawans at the remote border post the aircraft means the supply of essential commodities like food and medicines, and is their contact with the rest of the world. It comes as a saviour when a sick or injured person is to be admitted to a hospital. Talking to mediapersons, some of the villagers said the fare charged for the flight was a bit steep. However, for Naib Subedar Nem Bhadur Rana and Havildar Janardan Prasad of Assam Rifles, our two fellow passengers from the ALG, the aircraft came as a blessing as their emergency leave had been sanctioned and it would have taken them seven days to reach the nearest town if they had to go on foot and that would have been too late to perform their familial duties. The air logistics task has reduced drastically in the past 5 to 10 years and 1084 metric tonnes load was lifted in 2002-03. The indomitable spirit of the IAF flyers has come to symbolise dependability and succour in the face of daunting odds. Their work is a living example of an ideal man-machine-and-mission mix and they sure are living up to the motto: “Touch the sky with glory”. The writer visited the Northeast as a guest of the Indian Air Force. 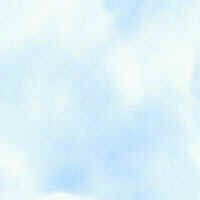 mod.nic.in/samachar/oct15-00/html/ch9.htm: Angels in the Sky. A brief look into the IAF's rescue and relief operations in the country.